The 10.1-inch HP ElitePad 1000 G2 is a convertible Windows 8.1 business tablet that succeeds the ElitePad 900, which was released in 2013. That device failed to set pulses racing thanks to its average 800p display and Clover Trail-based Intel Atom CPU, but it managed to stand out from the crowd thanks to a number of "jacket" accessories designed to boost factors such as battery life and and security. HP has set out to improve its latest ElitePad In almost every way by adding a faster processor, more RAM and upgrading the display. The ElitePad 1000 G2 starts at £586 ($739) for 64GB eMMC storage, rising to £813 ($1,009) for the same specs and 128GB capacity. Lenovo's ThinkPad 10 tablet, which landed earlier this year and has attracted praise for its excellent full-HD display, snappy performance and impressive accessories, stands out as the ElitePad's main competitor. Then there's Microsoft's 'laptop replacement', the Surface Pro 3, which strides the middle ground between consumer-focused style and enterprise savvy, being both thin and light while offering a stylus and docking station. The ElitePad 1000 G2's chassis is constructed of a high-quality aluminum that feels premium to touch and solid in the hand. It measures 9.2mm thick and tips the scales just short of 700g, making it heavier than Lenovo's 10.3mm-thick ThinkPad 10 (576g), but slimmer. It's one of the nicest-looking business tablets I've held, and it's almost a shame that you'll likely end up hiding it away in one of HP's expansion jackets. The ElitePad has a 10.1-inch IPS display featuring a native pixel-resolution of 1920 x 1200, up from the Elitepad 900's 1280 x 800. It's a great resolution for the size of the device, but only after adjusting Windows 8.1's scaling options to lower the magnification of the UI. I then found the native desktop area a joy to work on, with ample space to snap apps and documents side-by-side while posing none of the legibilty options found on notebooks with 4K screens such as the Yoga 2 Pro. Its touchscreen panel is very bright and easily viewable outdoors when set to full brightness. It offers excellent, near-180-degree viewing angles and is scratch resistant, with an anti-smudge coating that makes it easy to clean. Corning's Gorilla Glass 3's presence means it's also tough to boot. Touch input works flawlessly, allowing you to pick out icons, text and cursor points with good accuracy. There are cameras on the front and back of the device (2MP on the front, 8MP on the rear) which are adequate for video calling, but little else, being comparable to the type of snapper you would find on a mid-range smartphone. Without accessories, the device offers a meagre selection of ports, made up of an audio port and proprietary power connection, alongside a micro SD slot. For that reason, you'll want to consider picking up one of HP's expansion jackets to get hold of more. The ElitePad's Jacket with optional Jacket Battery is billed as an accessory, but it's vital if you're looking to eke maximum performance out of the device. According to HP, the jacket can boost the device's battery life by a whopping 20 hours, depending on the use case, while offering a decent level of protection. On sale for £69 ($119), it also extends connectivity by including two USB 2.0 ports, one HDMI port and a stereo/headphone jack. Made of a rubbery material, it's soft to touch, and it makes me wonder whether HP will one day offer a metal version for added protection that keeps in with the ElitePad's design. Further connectivity options are available if you opt for the accessory dock, which turns the tablet into a convenient mini desktop setup by adding four USB 2.0, VGA, HDMI and Ethernet, while acting as a stand. You would be forgiven for thinking that the tablet plugs straight into the dock, but it needs to be inserted into an expansion jacket first (one with or without a built-in battery) - you'll get a notification pop up every five seconds with the message "this device is unsupported" if you don't. This can be problematic as you can't use the dock's USB ports unless it's connected to a power supply. Because the expansion jacket's USB port is on the underside of the device, there isn't enough room to plug something into it while the dock is sat on a table unless it's hovering near an edge. It means that you'll have to remove the tablet from the dock and lay it flat to get proper access to the USB port, which makes it little more than a glorified stand in the absence of power. The HP Bluetooth Keyboard K4000 is good for a standalone Bluetooth keyboard, with decent travel and well-spaced keys on its chiclet-spaced keys. It's light and well-built, making it a highly portable and reliable solution when twinned with the ElitePad. It doesn't quite match the comfort of typing on a full-size laptop, but for a portable option I've come across far worse. 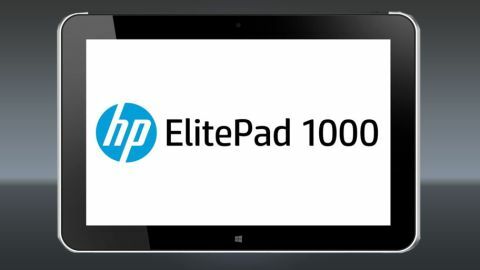 For communication, the ElitePad 1000 G2 supports 802.11 a/b/g/n wireless and Bluetooth 4.0 (which is used for pairing the keyboard), and it can also be configured with an integrated LTE module that works with HP's 4G data service, HP Mobile Connect, making it perfect for those who require a connection out on the road. The ElitePad also comes with a stylus that's adequate for pointing at elements on the screen, but it's less useful for drawing and is far less precise than Surface Pro 3 Pen. The amount of "lag" when making strokes, combined with the comparitively large gap between the glass and the display itself, make it unsuitable for writing quick notes, instead being more suited to slower, more precise drawing. HP decided to include an Intel Atom processor in the ElitePad rather than a Haswell chip, indicating off the bat that it won't be competing with the likes of the Surface Pro 3 or other machines equipped with the chipmaker's punchier Core-series CPUs in the performance department. On the other hand, it's been some years since the days of the sluggish chips that gave the Atom line of processors a bad name, and the Intel Atom Z3795 that's found in the ElitePad is one of the fastest in the current Bay Trail generation. The CPU has four cores with four threads running at 1.60GHz (turbo boost to 2.4GHz), running under Windows 64-bit Pro. Combined with the nippy 64GB eMMC drive, the device boots in under 10 seconds, opens apps instantly and can play 1080p video smoothly when connected to an external display over HDMI. Inside, Intel's HD4000 is used for graphics, so you'll be restricted to very light gaming. The ElitePad 1000 G2 is mercilessly free of bloatware, instead shipping with security-focused applications that take advantage of the TPM inside. Included are tools such as HP Client Security, which can not only restrict access to ports and enable encryption, but also manage passwords and configure BIOS-level security. There are also options for LANDesk and Microsoft management platforms.